This installation was made possible in part by public funds from the New York City Department of Cultural Affairs in partnership with the City Council, Council Member Jimmy Van Bramer, Viper Records, EarSay and the Sorensen Center for International Peace and Justice. This CUNY installation furthers Lehrer’s recent interest in bringing literature and poetry to people in non-traditional ways. In his novel A Life In Books, his protagonist Bleu Mobley produces lines of book clothing, book lamps, toilet paper poems, and large scale leaves of poetry that fly over town and country. In the fall of 2015 and again in 2106, Lehrer worked on another large-scale window project, Art In Vacant Spaces, with his Community Design class at SUNY Purchase, the White Plains BID (Business Improvement District), and Sloan as poet. “Instead of populating these vacant storefront windows with pretty pictures and nice designs,” said Lehrer in a USA Today article, of the White Plains project, “I thought why not populate them with visual poems that reflect the people and the conditions of the place.” The CUNY Law School installation continues this idea of bringing poetry to the streets while reflecting the values of a place and its inhabitants. An installation of visual poetry written by Judith Sloan, visualized by Warren Lehrer. 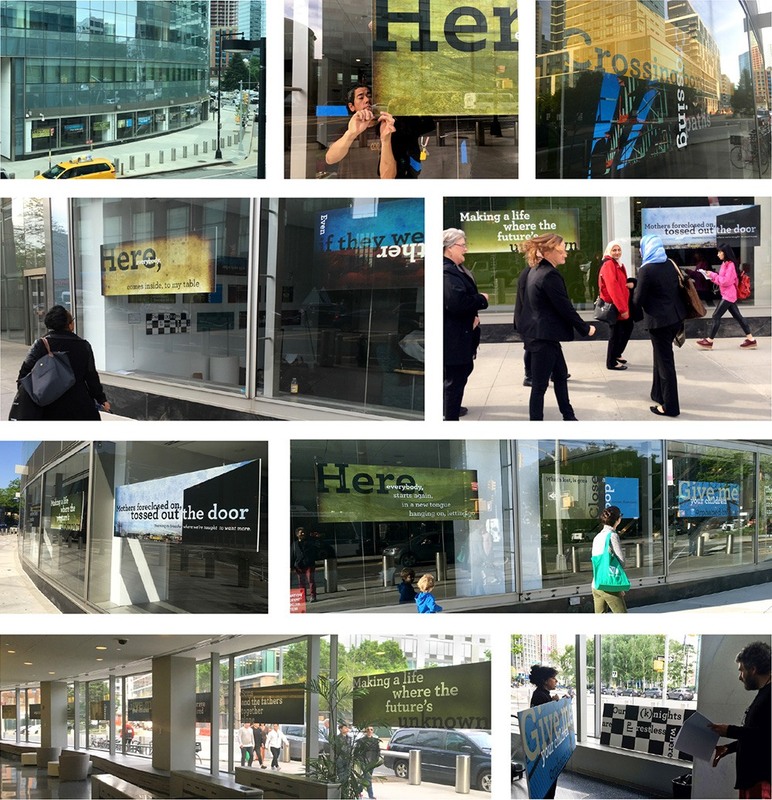 The window installation is part of the Sorensen Center’s Justice Through Art Initiative, a collaboration between the CUNY Law School community and artists “in order to bring new perspectives and depth to social justice issues and legal challenges.” Lehrer’s panoramic design sets discrete phrases within the poem into their own panels—through typography, photography, color, shape, metaphor. Each of the 17, six-and-a-half foot wide panels float within a street level window. The panels are double-sided, enabling viewers to interact with the poem inside and outside of the building. The installation instigates a series of dialogs and performances beginning in September, 2017, at CUNY Law School.